Install the ANT Radio Service on your Android device to gain access to the top sport, fitness and personal health applications. This background service is required by these applications to enable the wireless connection to ANT+™ sensors such as a heart rate strap, foot pod, blood pressure monitor and more. The ANT Radio Service is not a runnable app, but adds fun and value to your sport, fitness and health activities, allowing you to view your data in real-time on your phone. With ANT+ you have the opportunity to link to top devices and applications to collect, transfer and track your very own activity data. New apps and devices are continually being developed, with endless opportunity for personal monitoring. ANT+ is an extremely power efficient solution with advanced functionality, that gives you the most reliable data, simply and easily. 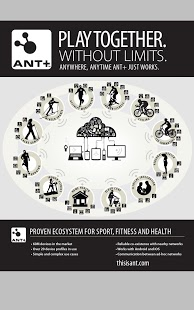 ANT+ is an established wireless technology with over 60 million devices in the market. 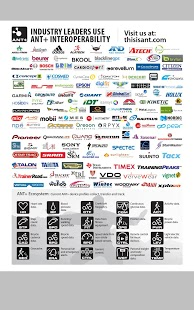 See http://www.thisisant.com/directory for all ANT+ certified products and compatible products from all manufacturers. Look for the ANT+ logo on your devices to ensure you get the best in sport, fitness and health monitoring. To learn more about ANT+ visit http://www.thisisant.com. This service may be pre-installed by your phone manufacturer, providing the ANT+ functionality you bought your phone with. This is exactly the same as the applications which provide WiFi, Bluetooth, Camera, Contacts, Phone…the list goes on, except with the added benefit of it being updated to the latest version even once you stop receiving Android version updates. On these phones, Android will not let you uninstall the ANT Radio Service as it is considered a \”system app”, however it will only run while you have chosen to run an application using ANT+. 2. An Android device with the USB Host feature (optional in Android 3.1 and up) and an ANT USB Stick (ANTUSB2 or ANTUSB-m) through a USB OTG cable or host A port. Requires the ANT USB Service. 3. An Android device with the USB Accessory feature (optional in Android 2.3.4 and up) and an ANT Android USB Accessory. Requires the Selfloops ANT Service. The ANT Radio Service can be installed on the Android Emulator and utilizes an ANT USB Stick on a Windows PC when used in conjunction with the ANT Android Emulator Tools. To do this it requires the INTERNET permission. This allows initialization of whether ANT should be turned off or kept on when Airplane mode is entered. Please send any questions to info@thisisant.com as it is difficult to respond to all questions left in reviews.